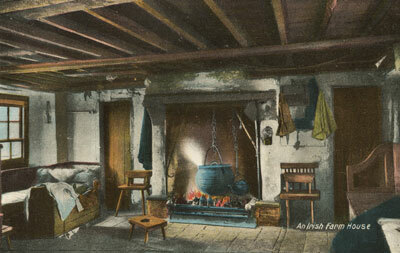 Many Irish cabins had one or two windows in the front and the same in the back. The number of windows was limited by the high cost of glass. Adding a window was expensive and had few benefits. Generally the landlord would not give his tenant any compensation for improvements made and would, in fact, often raise the rent. I had read in several places that the number of windows was also restricted by the "window tax". However, further research revealed that the window tax did not effect the small cabins. The window tax varied over time but did not apply to houses with less than seven windows. There were few options for artificial light inside the cabin. 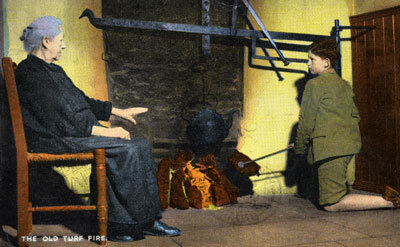 Turf fire was the main source of light as well as heat. Turf or peat has a very distinct and pleasant odor while burning. 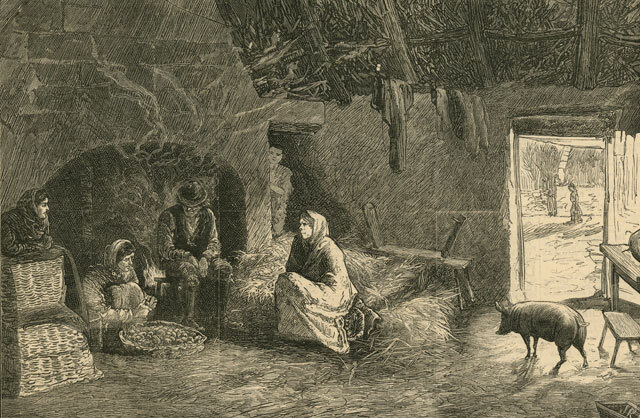 Many cabins did not have a chimney; smoke escaped through a hole in the roof or through the thatch in general. "was only half a cabin, as the Hollarans next door occupied the other half. Really only one room, it had been cut in two by a narrow wall that did not reach much above a man's height. Behind this partition was the family sleeping place. All the children had been put away there before the hag's arrival, lest they might get terrified by her raving. This was a useless procedure, as they could hear everything above the top of the partition. 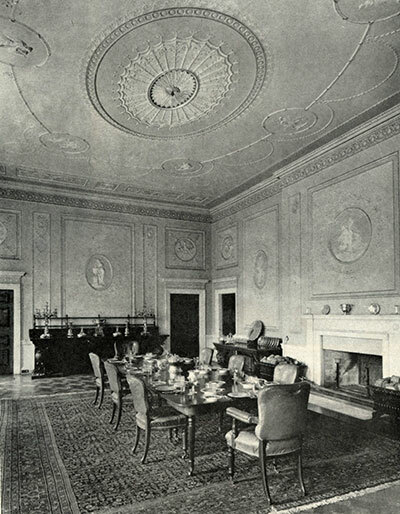 The living-room was in a very sordid state which was only natural on account of all those children romping about in a chamber that was only ten by eight, with a great deal of that space occupied by the furniture, cooking utensils and farming tools. There was even some oat straw and a little heap of potatoes, all that was left of the year's crop. The floor was an amazing sight. The earth had nearly all been dug up by the children and made into mud pies. The naked rock was exposed and it was quite difficult to walk from the door to the hearth, in the gloom which the light from a tallow wick could not dispel. There was hardly any light from the fire, which smoked badly. Heron, although he had his share of turf back in the common bog, had cut no turf that summer owing to a fight he had with the neighbour who cut with him. So he had now to rely on dried cow-dung for fuel. The dung had not dried properly and it smoked without giving light." 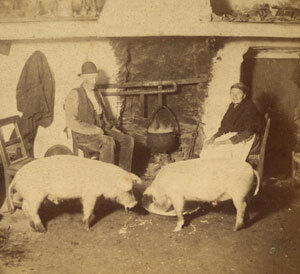 "We kept the Pig in the Parlor"
There are many references to the Irish, especially in the west of Ireland, keeping their animals in the house with them. However, it was the practice of peasant farmers the world over to keep their animals in or very close to the house. In the days before central heating animal warmth made a tremendous difference in comfort. Ireland has given the world some very great men, ambitious lads who served their king in India, who have sailed the seas, and who have contributed much to the political and commercial life in America. 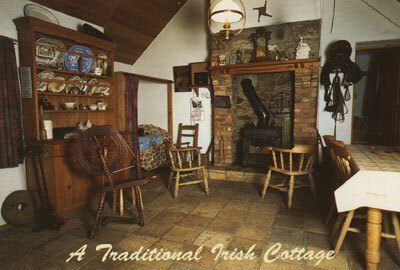 Many of them were born and brought up in just such a cottage as this. It has only two rooms, a living room and the bedroom which is entered through the open door at the right of the fireplace. Above the rafters which form the roof of the living room and bedroom there is a loft over which is the sloping roof. Here the children sleep. There is no stair going up the loft only a ladder. 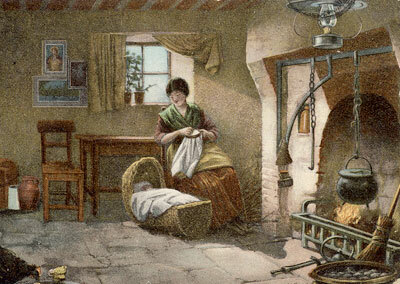 The only heat that any part of the house receives is from his homely fireplace. Though the stones of which is made are crude and the seams between the stones uneven it is strongly constructed. 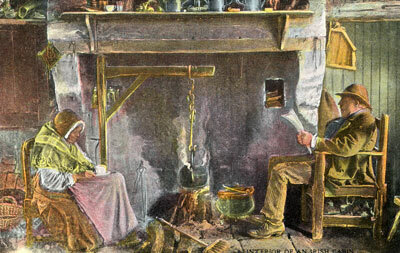 All the cooking is done here in the fireplace. Potatoes are boiled in the pot hanging from the bar. Bread is baked in a low iron kettle with legs. It is set directly over the bed of glowing coals and when necessary more coals are heaped upon the close fitting iron lid of the kettle. The only fuel used is peat, of which the Irish peasant must be careful, for though peat is very cheap he cannot afford to buy much. 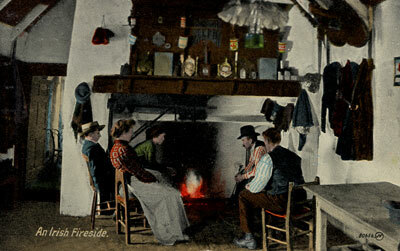 The wooden chairs by the fireplace upon which these Irish people are sitting have seen long service. They are well made and have handwoven rush seats. 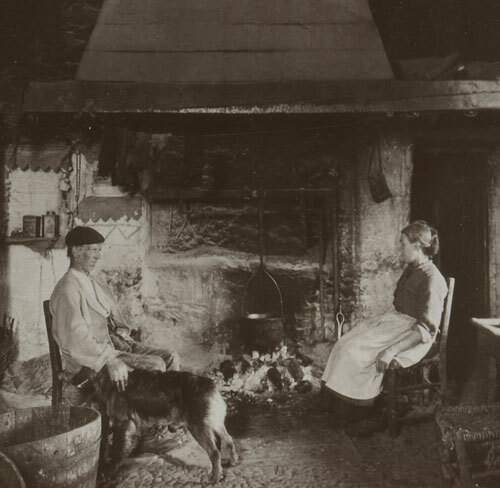 On a winter night when the fire glows on the hearth the family gathers about and then stories are told about fairy folk and the banshees and witches. 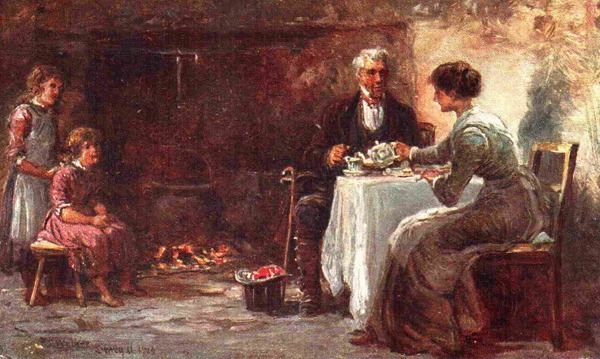 "The miserable huts of the peasantry, seen by the feeble light which comes through the doorway and smoke-hole (to talk about chimneys would be an insult to architecture) give one the idea, not so much that the pigs have got into the parlour, but that the family have migrated to the sty. 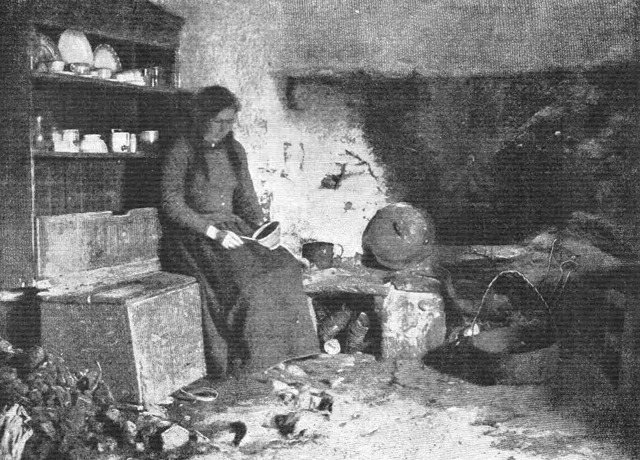 An unpaved clay floor, a roof of straw and weeds, dank, soaked and trotting overhead, a miserable bed in the corner, an iron pot over a peat fire, are the principle items of the property. Before door is a sink, black and filthy, for the refuse. Yet the inmates look hale and happy beyond what one would hope to see, and the thought at once suggests itself, how much might be accomplished by such a people, awaking to assert its dignity, and to discharge its duty." 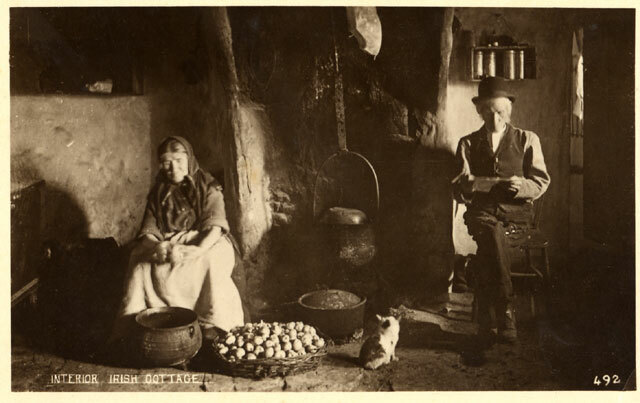 "Away from the tourist track, amongst the poor, the frank hospitality which is a feature of the national character is to be found in perfection; often in the humble cabin one meets with charming manners, and learns to understand the full meaning of an Irish welcome"
On taking refuge here from a storm, which continued nearly all day, I was hospitably entertained, and when I left, neither the good man nor his wife would take any remuneration whatever. As a small return, I have endeavored to give their likeness in the happy little homestead as I saw it. The image is interesting enough, but what is impressive is the accompanying article. This poverty stricken lady and her three children could read, but not write. 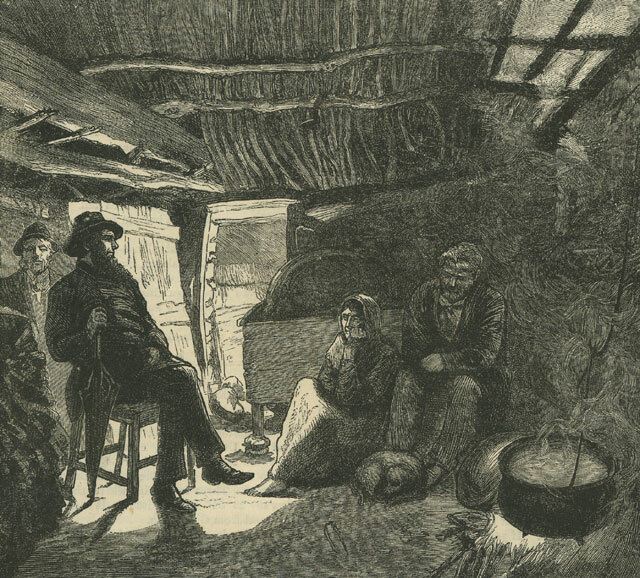 The accompanying article speaks of "the miserable condition of a number of mud cabins in the principle street of Kildare." 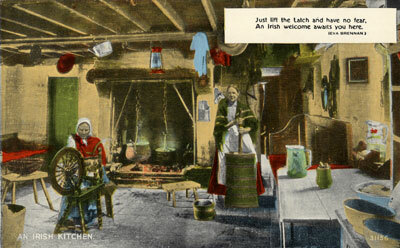 This images shows the interior of one of the cabins where the inhabitants "lounge in listless despondency". The dwelling consisted of a single room, eight feet by ten, occupied by a widow, her son, age 20, another son, age 16, and a daughter, age 10. They had no bed or bedding, "but slept in their clothes on the bare ground, with a few dirty rags over them. 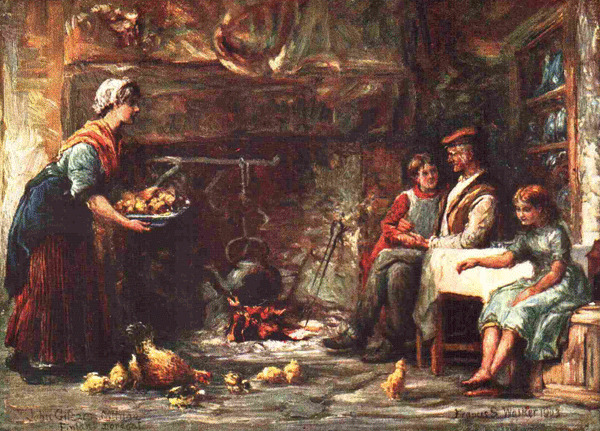 The only furniture was a rickety table and a broken bench, with an iron pot and kettle and two or three cups". 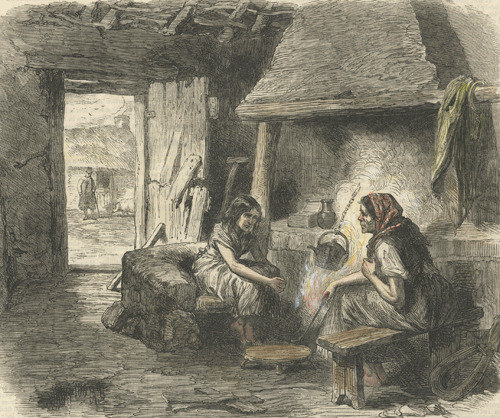 "Save, that it actually has a chimney and a comparatively lofty roof, blackened, however, by a century of smoke, and that it accommodates at night simply a donkey instead of the customary pig, this is about as bad a specimen of an Irish cabin as could be found in any village in the country. There were puddles of water in different places on the mud floor, and the planks of the door very nearly tumbled apart every time it opened and shut. The widow who occupied the cabin although in rags and with bare legs and feet, was a person of some intelligence, who has a good choice of language, and had taught her children to read, if not to write as well; her idea being "there is nothing like education to get on in the world"
Unfortunately, the rest of the article was cut off from the image. Notice the man with his pig who can be seen though the open doorway. 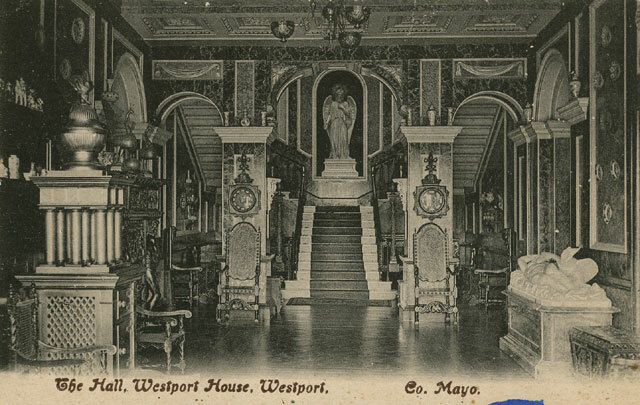 For contrast between the haves and have nots, here are some images of Westport House, Westport, Co. Mayo. This 18th century Georgian mansion was built and is still owned by the Browne family, descendants of the Irish Pirate Queen Grace O'Malley. Westport House was the seat of the Marquess of Sligo. THE SOUTH FRONT OF WESTPORT. In the foreground are the replicas of the columns from the Treasury of Artreus at Mycenae, the originals of which were brought to Westport by the 2nd Marquees of Sligo in 1812. The 2nd Marquees excavated at Mycenae where he discovered the columns and had them transported to Westport House. The columns lay for years in the cellar at Westport until 1904 when they were identified by the Earl of Altamont and presented by the 6th Marquees to the British Museum in 1905. 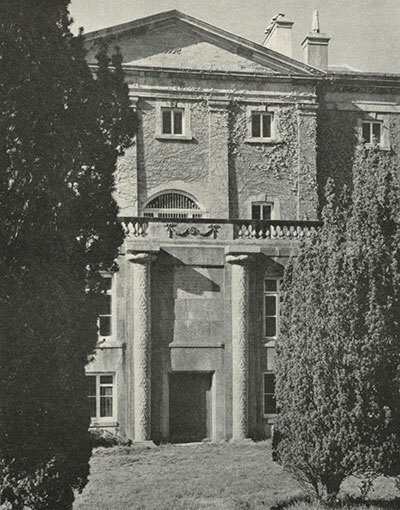 The British Museum gave the replicas to Westport house in 1940. Land and Tenant Issues in Ireland: Lord Mountmorres's house and Captain Boycott's house.